Although they can sometimes seem like an extreme hassle to completing a project, building permits help to ensure the safety in the construction industry and their respective customers. Building and structural permits ensure that all work done by a construction company meets a certain standard that allows it to be safe enough to be used without a realistic potential for danger. These building permits prevent shortcuts in the industry, protects the public and promotes the general health of people. Just like traditional construction, modular construction typically must abide by the same set of standards as their stick-built counterparts. These permits ensure a number of standards are met for the structure, such as means of egress, adequate lighting, structural strength and stability, ventilation, and safety from fire and other hazards. There also are huge differences in the permitting required for the different modular structures that Panel Built offers. And, perhaps more importantly, the permits required for a structure can vary a lot from place to place, meaning state to state, county to county, and town to town. Some places have more strict codes, permits, and city ordinances, so the best option will always be to do your research beforehand so that you do not find yourself between a rock and hard place in the future. 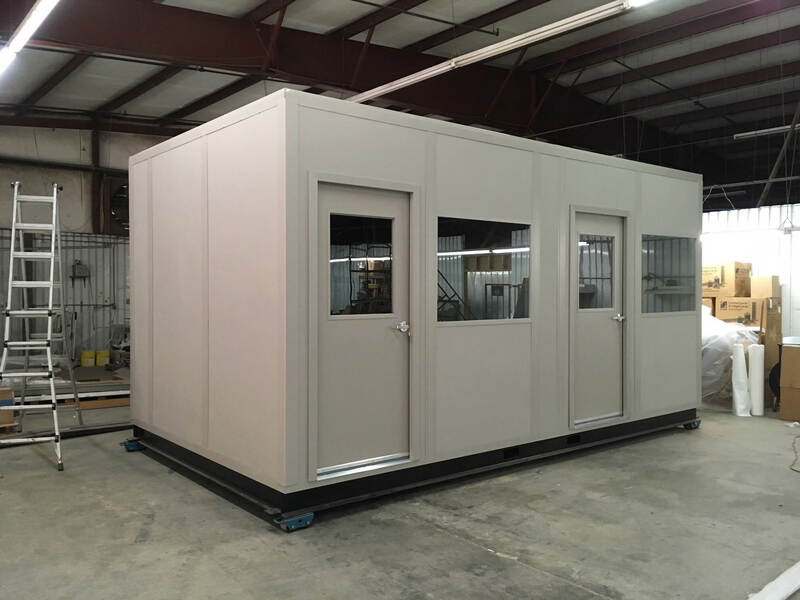 In most instances, modular offices do not require permits in order to be erected in your facility. They do not need permitting because these structures are defined as not being a permanent structure. Because modular offices are often classified as a type of equipment for a company, they fall under a different set of rules, allowing you to get around permitting in most of the cases. However, as mentioned previously, there are different rules and regulations in different places. Different counties have different rules pertaining to permitting modular offices. Therefore, it is always best to check with your local officials to make sure you are following the correct guidelines. For mezzanines, it is a much different story. In most counties, installing or erecting a mezzanine is going to require a permit from the county. Depending on the use of the mezzanine, it will have to meet different requirements. The first hurdle you are going to come to is whether to build to IBC or OSHA standards. This will depend on what type of traffic your mezzanine structure is likely to incur. 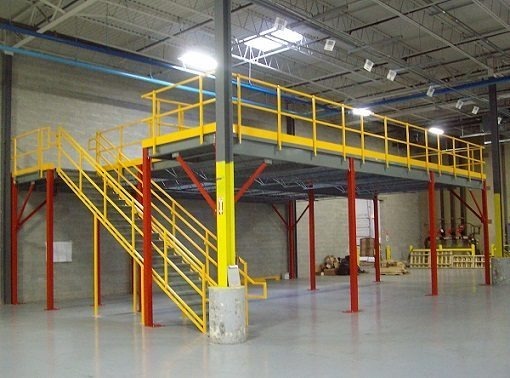 If your mezzanine is going to strictly be used by your own personnel, then OSHA stair codes will be fine to use for the mezzanine system. However, if your mezzanine is open to the public, then IBC must be used, which carries with it much stricter and concrete guidelines. 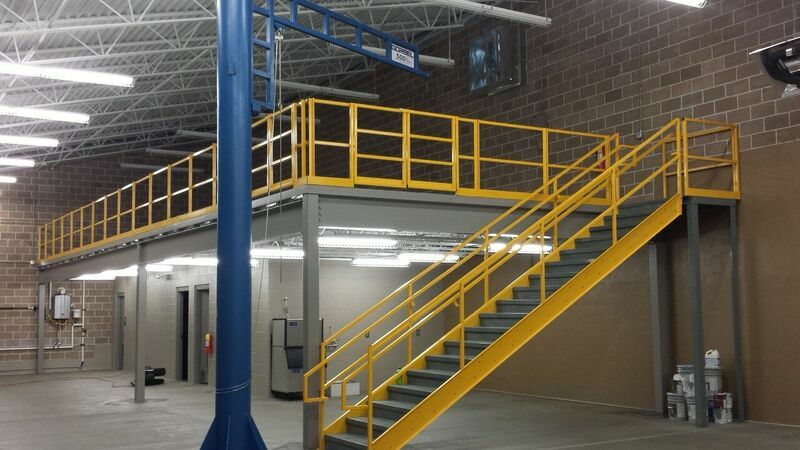 Now, you might have your mezzanine built perfectly to IBC or OSHA code with all the hand railing required and a perfectly designed IBC stair system, but the mezzanine system still might not fall under your county’s specific codes, you might still find yourself out of luck (and money). The most common hurdles you will find for permitting a mezzanine will refer to the means of egress and fire code. For those unfamiliar with the term, means of egress refers to the ways to get on and off the mezzanine, or in and out of a room. For many safety codes, there must be multiple means of egress in order to provide an alternate route off of the mezzanine in case one for of entry/exit is blocked for one reason or another. In reference to rules in relation to fire code, it will typically be in relation to the presence of a sprinkler system above/and or below the mezzanine floor. As you can imagine, for a manufacturing facility, warehouse, etc. the fire suppression system, will be set up from the floor and will only be able to protect the area directly below from fire damage, and a mezzanine floor throws a pretty big wrench into this plan in most instances. There are often two ways to remedy this situation. First, with a sprinkler system above your mezzanine, you can run a secondary sprinkler system underneath the deck of the mezzanine. The initial sprinkler system will cover the deck of the mezzanine, and the secondary sprinkler system covers the facility floor. Second, in some cases, there is a way to solve this problem without running a secondary line. Bar grating can be used for the deck of the mezzanine. The bar grating allows the initial sprinkler system to cover both the mezzanine and the warehouse floor. Finally, we have guard houses. For guard houses, there is one permitting aspect that is starting to occur more and more. Certain states require a third-party inspection on the design of the guard house in order to ensure that it meets requirements. Also, like in all other types of construction, specific cities, states, and counties have unique codes for their buildings and structures. 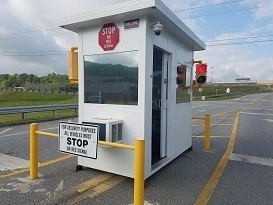 We can easily design the guard house to adapt to these regulations and have proved this in the past, installing a variety of guard booths across the county. All guard houses can be designed and built to the Americans with Disabilities Act requirements. In many cases, our guard houses are classified as an “accessory structure.” which is “a structure which is on the same parcel of property as a principal structure and the use of which is incidental to the use of the principal structure,” according to the FEMA website. Counties will oftentimes require permitting on these accessory structures, but typically, only if they exceed a predetermined number of square feet. For our local ordinances, our county requires a building permit for an accessory structure if it meets or exceeds 150 sq. ft. If the structure is below this threshold, no permit is required. Overall, with the variance of building permit requirements from place to place, there are not too many “rules of thumb” that encompass all regions. That is why, in most cases, it is best to look into your projects permitting on a case to case basis. Looking into your region’s permitting process and rules is always a good practice to ensure you do not run into any speedbumps later on in your project. If you’re looking to start a modular construction project, give us a call at 800.636.3873 or email us at info@panelbuilt.com. We would be more than happy to help and answer any questions you may have.